Also seeing them in London - cannot wait! Oh no, JW, what rotten luck. I am going to the London one, can't quite take it in to be honest! I know! I can't quite believe that they're going to playing the UK when I'm out of the country. I will be looking forward to reports from you! Amoy always creates fabulous illustrations. I don't think this has been added yet. Another N. America tour date!! VERONA, N.Y. - Rock supergroup Hollywood Vampires, featuring Alice Cooper, Johnny Depp and Aerosmith guitarist Joe Perry, is returning to Turning Stone Resort & Casino. The band will perform on May 17 at 8 p.m. in the casino's Event Center. Tickets go on sale Friday, March 23, at noon. Ticket prices range from $69 to $114 and are available in person at the Turning Stone Box Office, by phone at (877) 833-SHOW(7469) or online via Ticketmaster. 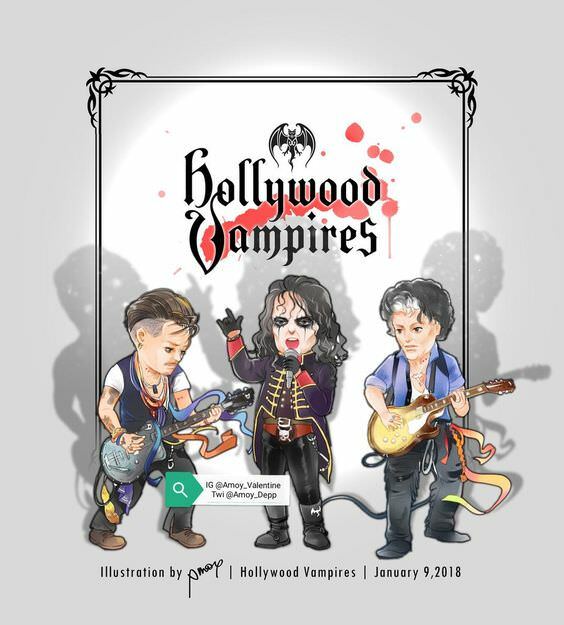 Named after the 1970s celebrity drinking club of the same name Cooper founded, Hollywood Vampires released their self-titled debut album in September 2015. The first stop on the band's summer tour, the Turning Stone show is one of Hollywood Vampires' only two scheduled concerts in the U.S. this summer. In her review of the band's 2016 sold-out Turning Stone show, music critic Katrina Tulloch said Cooper "commanded the stage with vigorous vocals, glam rock swagger and full "vampire" attire," while Depp proved he was "no Hollywood hack" with guitar picking skills that rivaled The Rolling Stones' Keith Richards. Thanks, humiliatedgrape, for posting this article. Nice to read such an all-out positive assessment of Johnny’s guitar skills - from a review by an actual music critic, no less! . . . . In her review of the band's 2016 sold-out Turning Stone show, music critic Katrina Tulloch said Cooper "commanded the stage with vigorous vocals, glam rock swagger and full "vampire" attire," while Depp proved he was "no Hollywood hack" with guitar picking skills that rivaled The Rolling Stones' Keith Richards. The Hollywood Vampires will perform at the Montreux Jazz Festival the 5th of July. On the 3.7 they will play in Zurich. Is anyone going to the Hollywood Vampire concert on May 18 in Orilla, ON?? If you are please DM me!!! smileydimples wrote: :loveshower: Is anyone going to the Hollywood Vampire concert on May 18 in Orilla, ON?? If you are please DM me!!! I can’t go, but I look forward to hearing about your adventure. I tried to use the twitter thing in the editor but I can’t get it to show. So here’s a link. Johnny's so unpredictable with his looks. Thank you Theresa! I thought the same that he might have filmed something. I am looking forward to the next album and wish the Hollywood Vampires a lot of fun on their wonderful tour. For you Vampire a lot of health and take care of yourself !!! I wish the best for you !! !